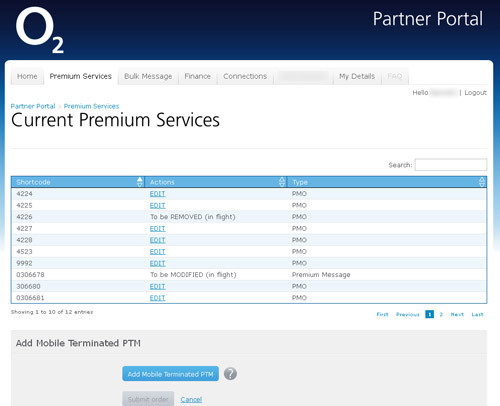 O2’s Partner Portal is an online wholesale service that allows companies (that act as resellers for smaller businesses) purchasing premium SMS services. 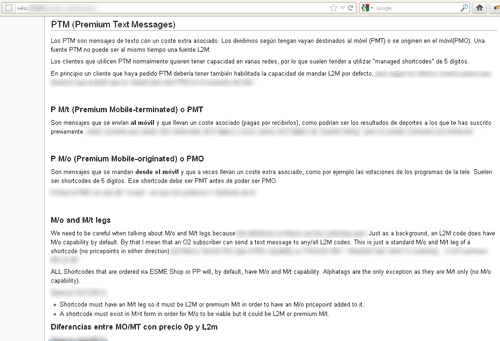 A new version was designed and developed by Telefónica I+D looking to solve previous version shortcomings. 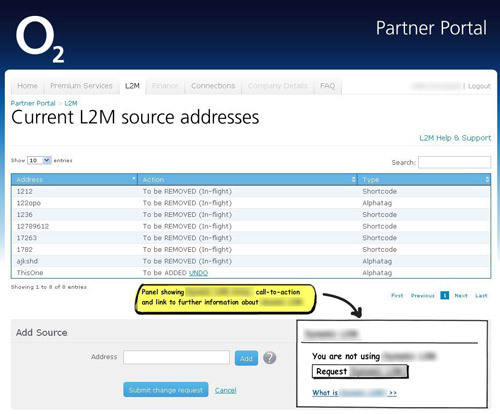 Enterprise premium SMSs are a big source of revenue for telecommunications companies like O2. 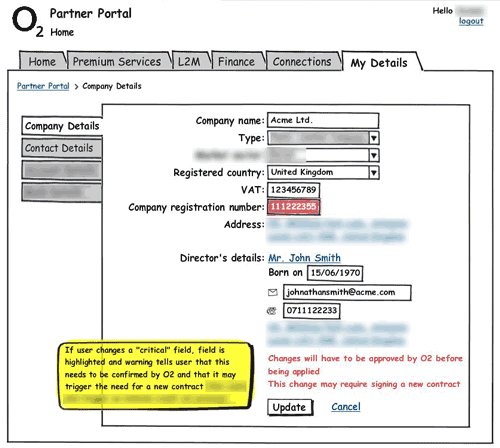 A few companies interact directly with O2, connecting with their systems and acting as resellers for small/mid businesses. 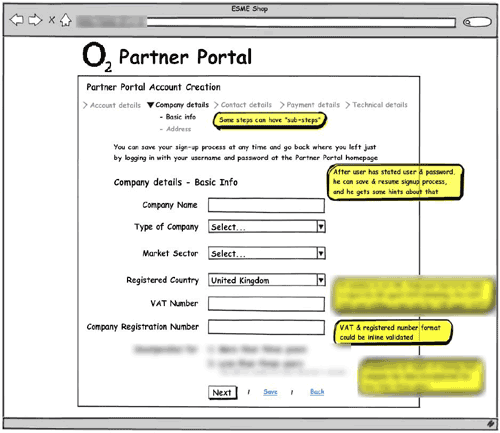 These companies use O2’s Partner Portal to keep track of their current portfolio and ask for new services. 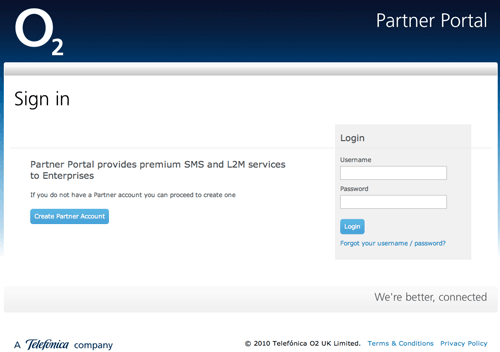 Current version was showing its age, and O2 asked Telefónica I+D to develop its new Partner Portal. Detecting some potential user experience problems, Telefónica I+D suggested its User Experience team to undertake design, and together we created the new Partner Portal. 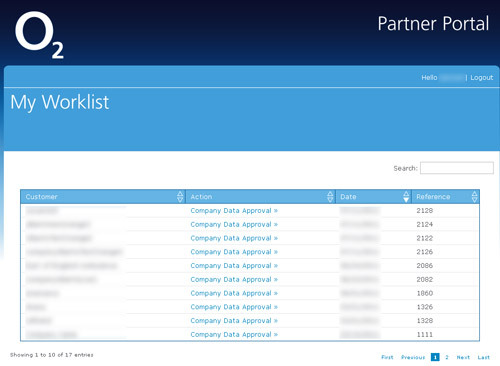 Reviewed new Partner Portal proposal to suggest usability improvements for development. 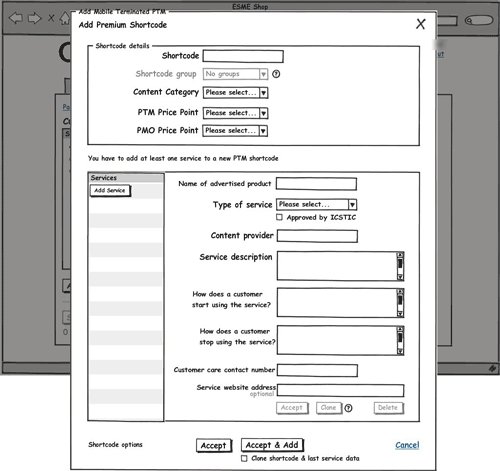 This revealed several wider User Experience concerns that, once raised, convinced O2 to assign the whole new design to Telefónica I+D (R&D) User Experience team. Development was going to follow Scrum’s agile methodology, so User Experience was going to be one sprint ahead, working on the next sprint’s design while supporting current sprint implementation. Besides, a 0-sprint research was commissioned. 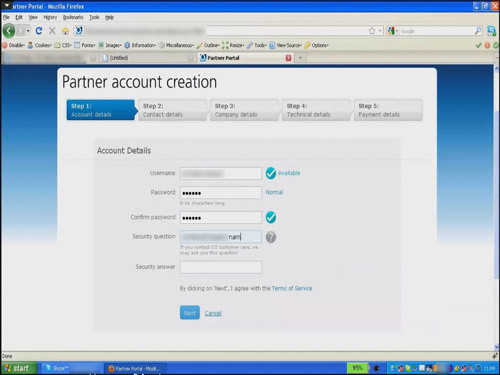 Conducted research on current Partner Portal. 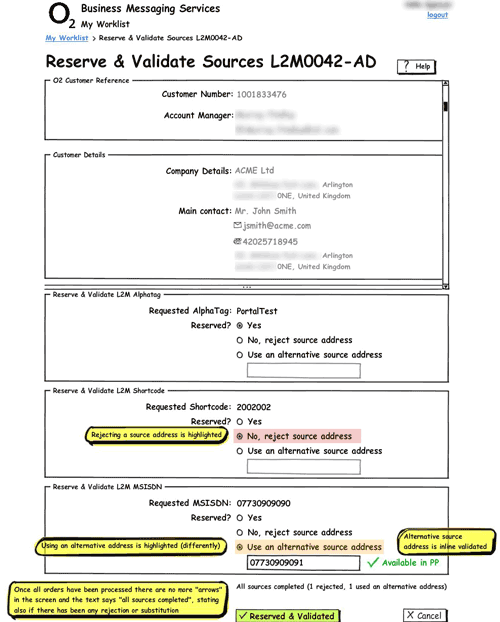 It served several different kinds of users (both internal O2 employees and external reseller companies) with different goals and tasks, and interviews and ethnographic research was conducted on location (on Leeds and London). A secondary result of these face-to-face interviews was that a common trust climate was established; further requests for information and cooperation were much easier. 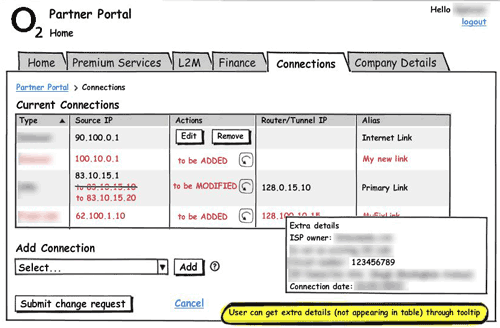 One of the major issues that were discovered was that a lot of required domain knowledge, critical to create a helpful interface, was not documented. Finding this information was one of the focuses of my research, and an internal wiki was created to centralise the recovered information. Development team also used this wiki to share development information and soon it was a vital tool for the whole project. 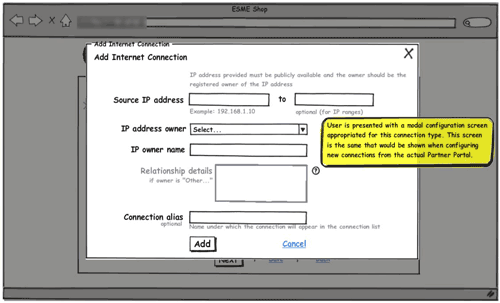 Given that the interface for the different users was very similar, initial sketches were ported quickly to Balsamiq wireframes, which allowed easier changes and maintenance. Important effort was put in simplifying the sign up process, which was complicated given that multiple business and technical details had to be entered. We allowed customers to save their progress, so that customers that needed technical help could get it and then resume the process. 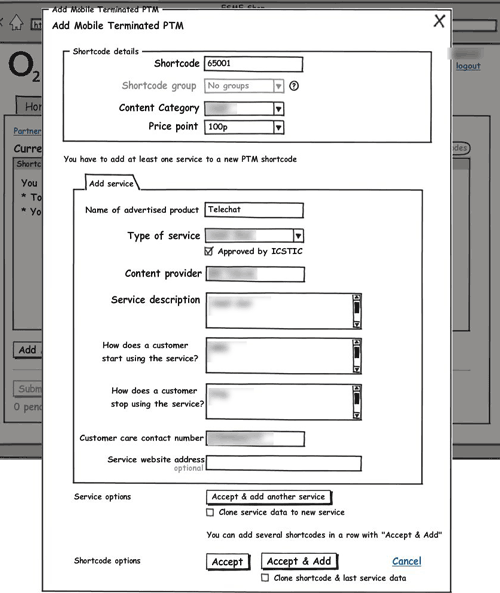 Screens for O2 employees were mainly work lists and web forms that had to be completed. Adding extra information on hover and using clearly groupings allowed us to create a consistent interface for all employees and their tasks. 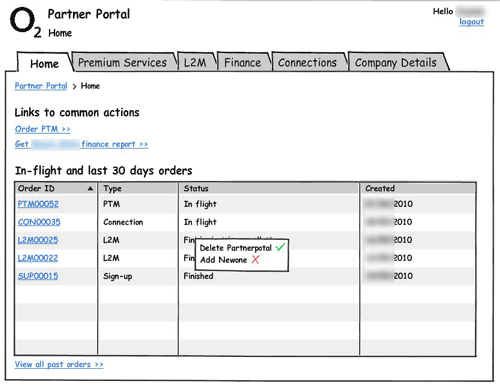 External customers would have a dashboard with links to common actions and lists last orders’ list, including “in-flight” ones. Customers would create new orders or manage their current portfolio from this dashboard, with tabs devoted to each kind of product. Several possibilities were considered. 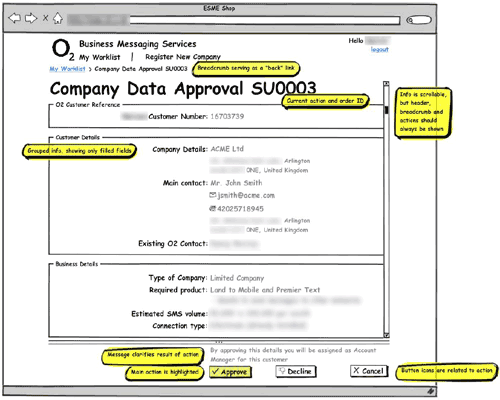 Customers may also manage their account information, editing their technical or administrative data. 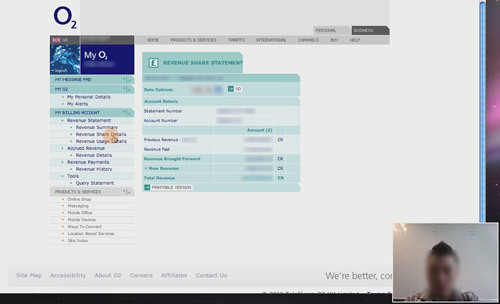 Quick changes were managed using screen captures from HTML prototype and adding wireframes where needed. 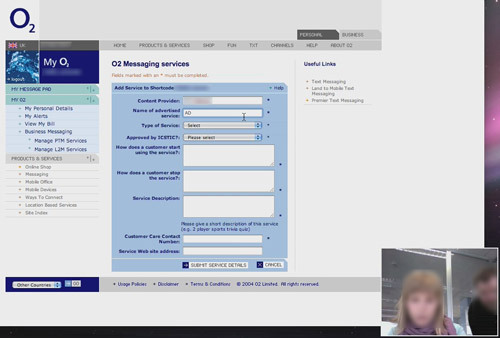 Wireframes were distributed to some of our already established connections representing each kind of user, and reviewed together (remotely, using Skype) to confirm design direction. Telefónica I+D Development team delivered partially functional prototypes at each sprint. UX team was usually one sprint ahead and new wireframes were ready at each sprint’s start. New prototypes were tested (remotely) with some of our already established connections for each kind of user. Detected problems were added to product backlog. 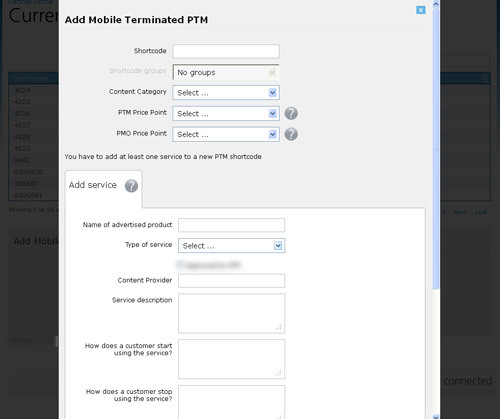 Experience with a wholesale web service, which needed to serve different kind of users with a consistent interface. Conducting ethnographic research and using established connections to get further information. Working in an Agile environment, integrating UX into sprints.